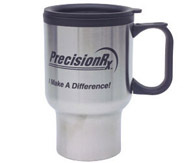 With your firm imprint or logo, our promotional mugs- fancy gift, make great promotional items. See our wide choice of mugs- fancy gift below. These items will make a big impression to promote your business by advertising with promotional products.. This means that everyone will see the mugs- fancy gift with your company imprint or logo, use them, and think of your firm when they need your product or business. It is also a great way to promote a specific event. Lowest price starting at: $3.24 each. Description: Plastic tumbler with stainless accent band. Screw-on lid with thumb slide. Double wall insulated. Lowest price starting at: $7.35 each.